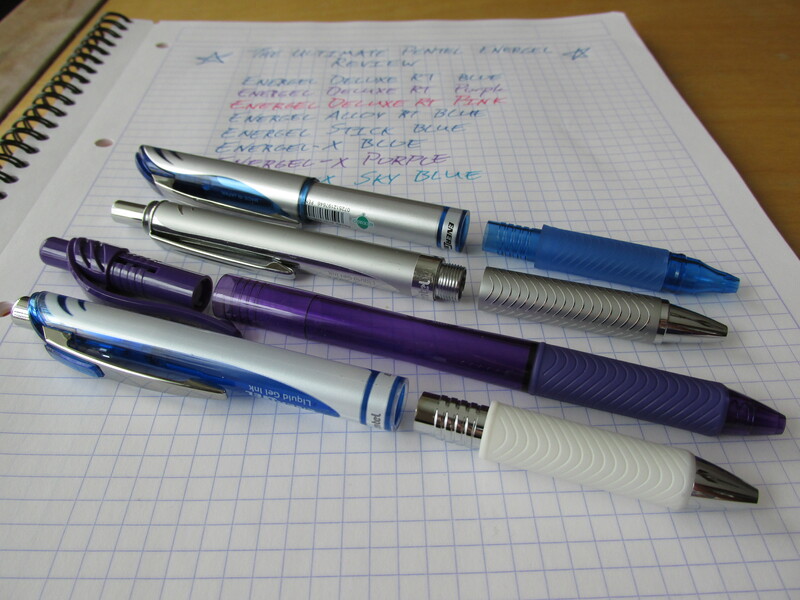 Frequent readers of this space know that the Pentel Energel is one of my favorite writing instruments. 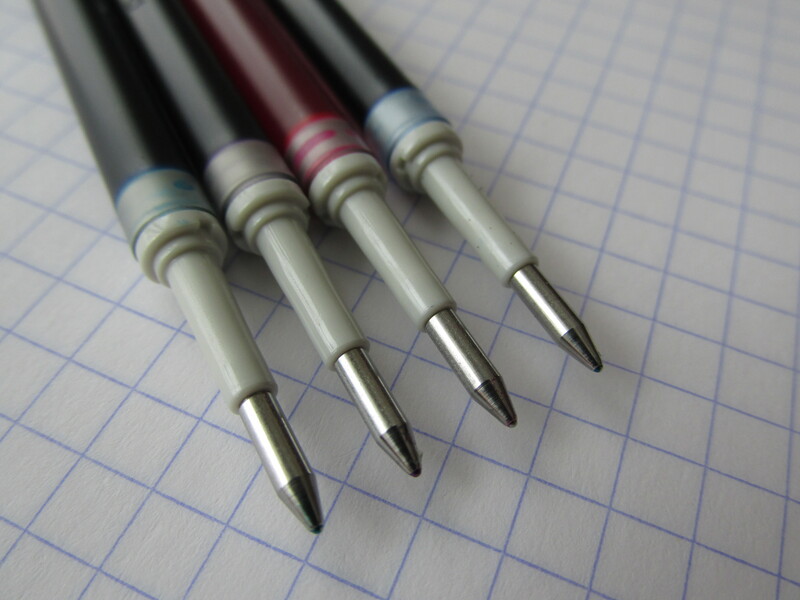 Like most gel pen brands, the Energel comes in a variety of point sizes with the 0.70 and 0.50 mm points being the most readily available. 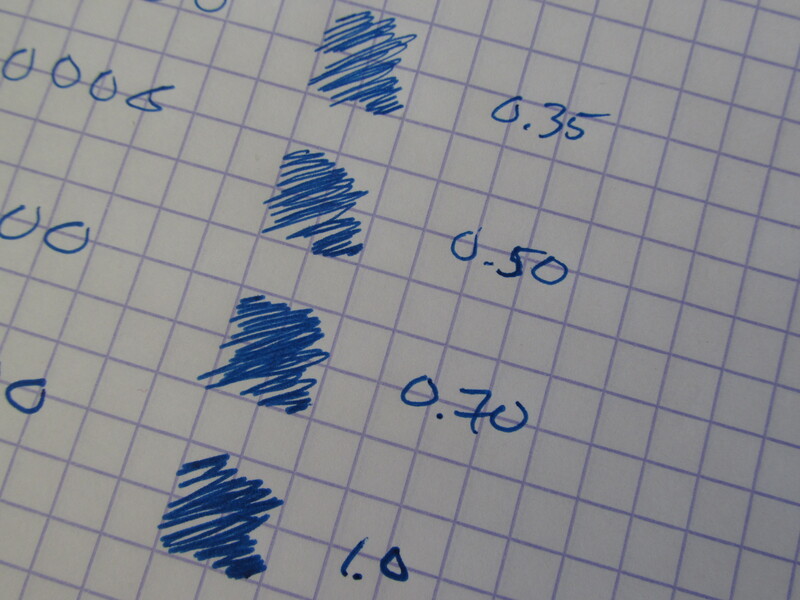 In my experience, the 0.70 mm is the more consistent writer as the 0.50 mm can skip occasionally. 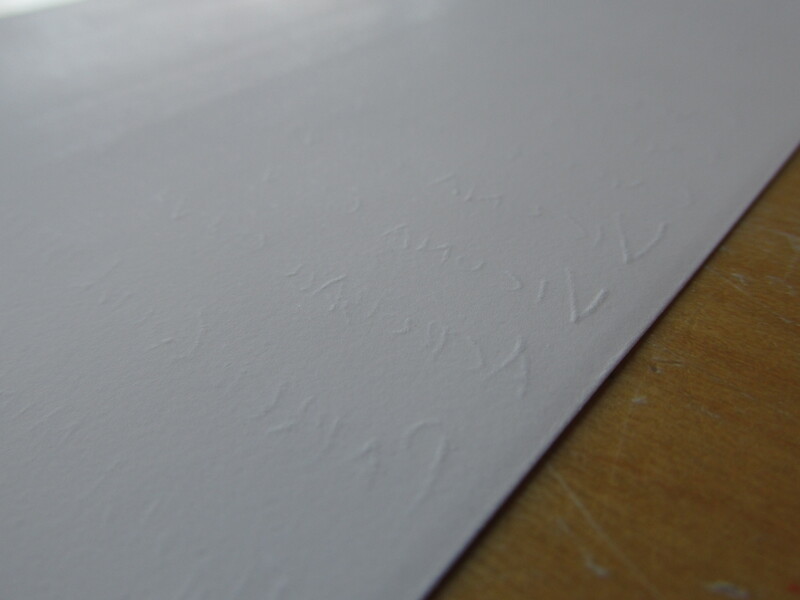 It’s not a huge deal by any stretch of the imagination but it can be noticeable on certain, less ink friendly, paper types. To complete the tour of the Energel line, I tracked down the broad 1.0 mm and the extra fine 0.35 mm tips and gave them a go. Here’s a shot of all four tips and writing samples. Interestingly enough, I found the 0.35 mm tip to be a better writing experience than the 0.50 mm. Somehow, despite its thinner size, the 0.35 wrote smoother than the 0.50 mm and it did not seem to suffer the occasional skip like the 0.50 mm. Again, I’m not trying to condemn the 0.5 mm. It’s a fine pen and it typically provides a consistent writing experience. So, who knows, maybe it’s something about my writing angle (somewhat closer to vertical than most) that lends itself to working more effectively with the 0.35 vs 0.50. As for the 1.0 mm, I can summarize the writing experience in one word – luscious. There can be a bit of an issue with getting a consistent start on down strokes (take a very close look at the top of the “1” of “1.0” in the picture above) but otherwise the pen glides across the paper and lays down a generous and dark line of ink. I haven’t used the 1.0 mm as my daily writer. If I did, I suspect the thicker point size would bleed the refill dry fairly quickly. Honestly, the 1.0 mm point size wouldn’t fit into my work flow often enough as a daily writer. However, I am thinking about tracking down the red or purple versions for grading purposes. The thick line and fairly quick drying Energel ink should work perfectly for that task. As you can see below, I have the 1.0 and 0.35 in stick versions. Pentel doesn’t seem to sell retractable versions of these bookend sizes but the refills are all interchangeable so you can mix and match as much as you want. 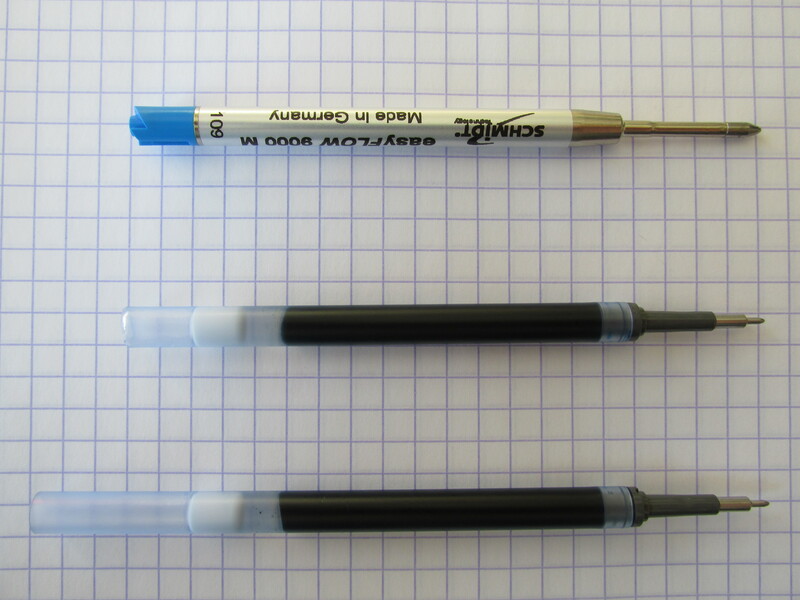 While I generally prefer my gel pens to be retractable, part of my preference for the 0.35 over the 0.50 may be because the former was the stick version and the latter was retractable and perhaps the more solid feel of the stick works better for more precise tips. The other big difference between the stick and retractable versions would be the clip. For looks, I like the silver of the stick version. For functionality, I like the curved plastic of the retractable version more as I tend to clip pens to the pocket of my pants and the plastic clip slides smoothly onto the thicker pant material. Those who carry their pens in a shirt pocket may find the clips of the sticks hold more securely to the thinner material. So, what are my point size preferences? I still favor the 0.70 mm for most situations with the, surprisingly, 0.35 mm getting more use than I initially thought. With the 0.35 working out nicely, I’m finding it hard to keep the 0.50 in the rotation and the 1.0 will be limited to situational use. When it comes to getting a real good measure of a pen, I find side-by-side comparisons helpful. 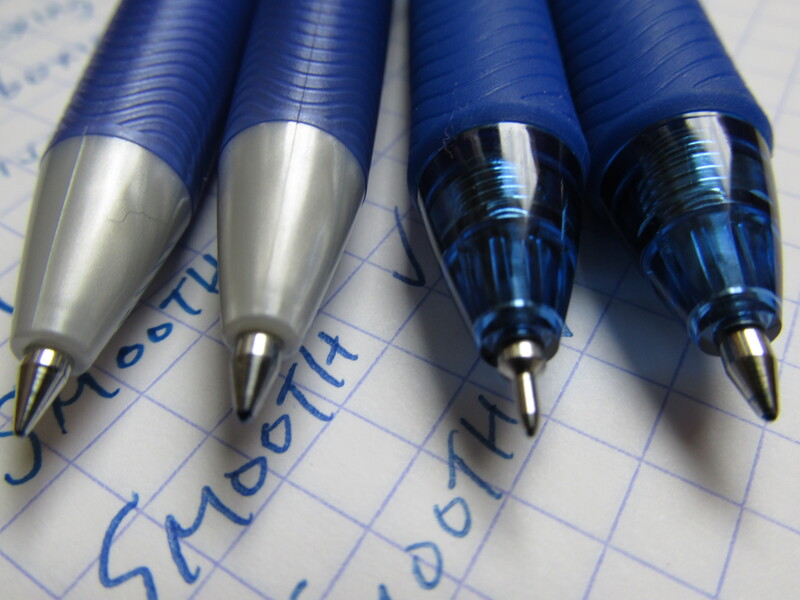 There is plenty we can say about a pen in a stand-alone test/review, but to best determine what I like and do not like about the writing experience I do some A/B testing. I suspect most pen wackos do so as well. 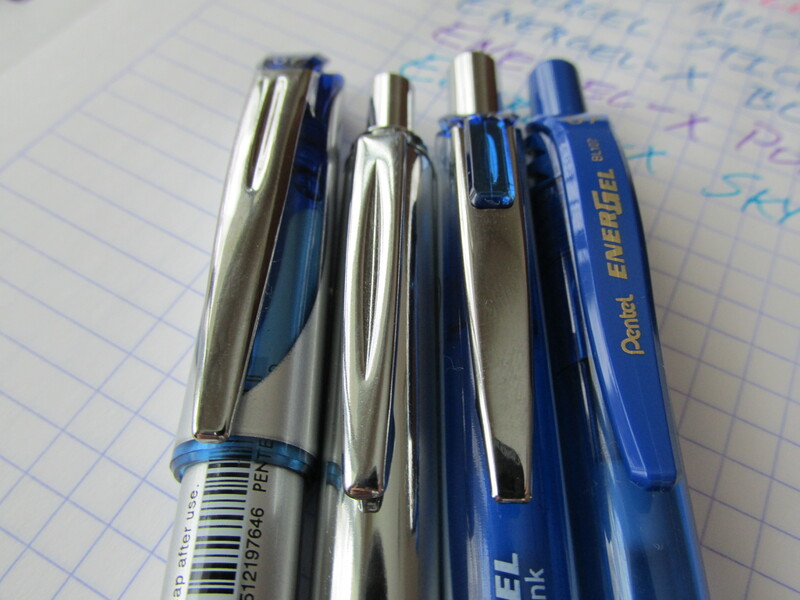 As I’ve written before, I’m a fan of Pentel Energel pens. 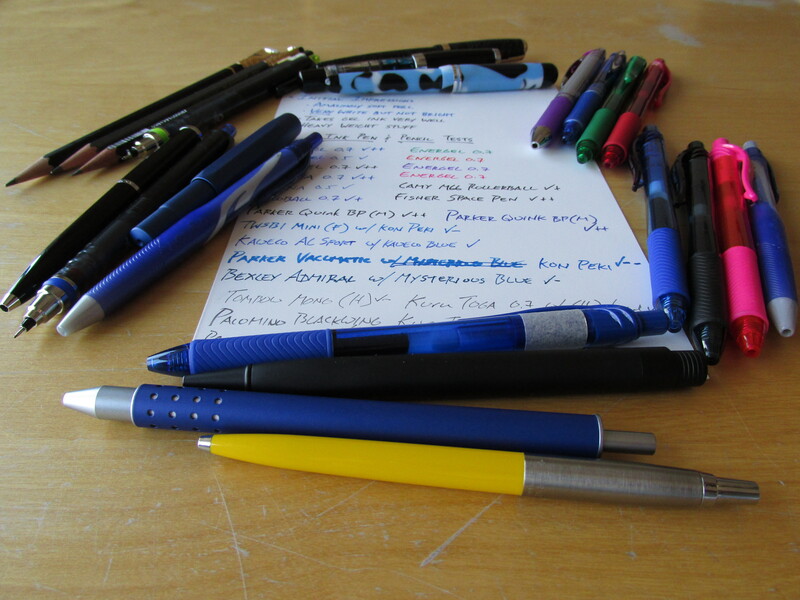 I also recently did a large batch review of several ballpoint, gel and hybrid ink pens. 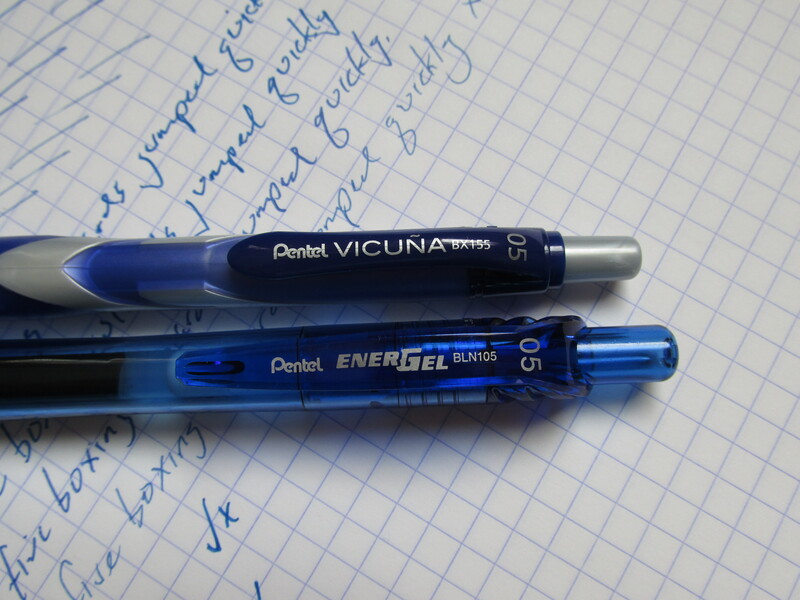 Since then, I’ve discovered the Pentel Vicuna hybrid ink pen in 0.5 and 0.7 point sizes and so a comparison of these pens to the Energel 0.5 and 0.7 pens would be instructive (at least to me). The vibrant ink, various colors, solid lines, quick drying and (practically) skip-free action of the Energels make them an ideal pen for me. I need the quick drying ink as a lefty and the colors come in handy for grading and other purposes at work. 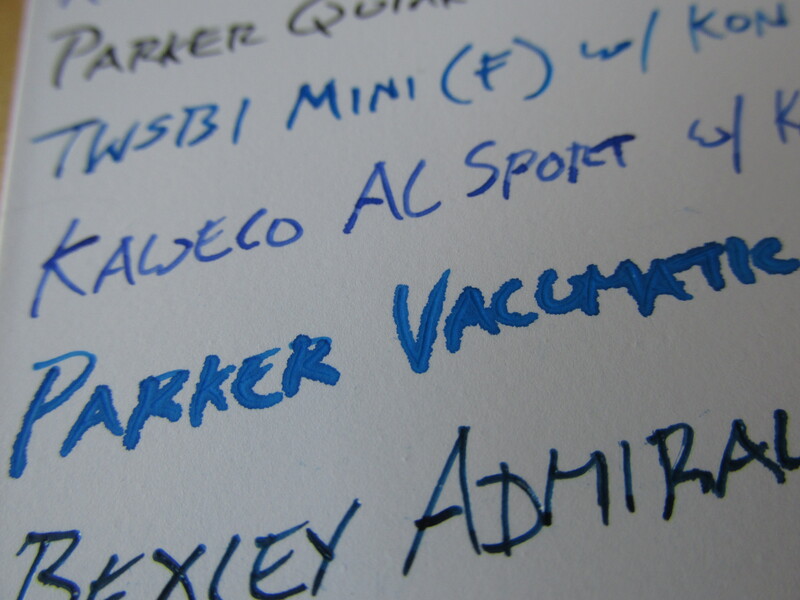 So, why even consider the hybrid ink of a Vicuna? Honestly, it’s a fair question. 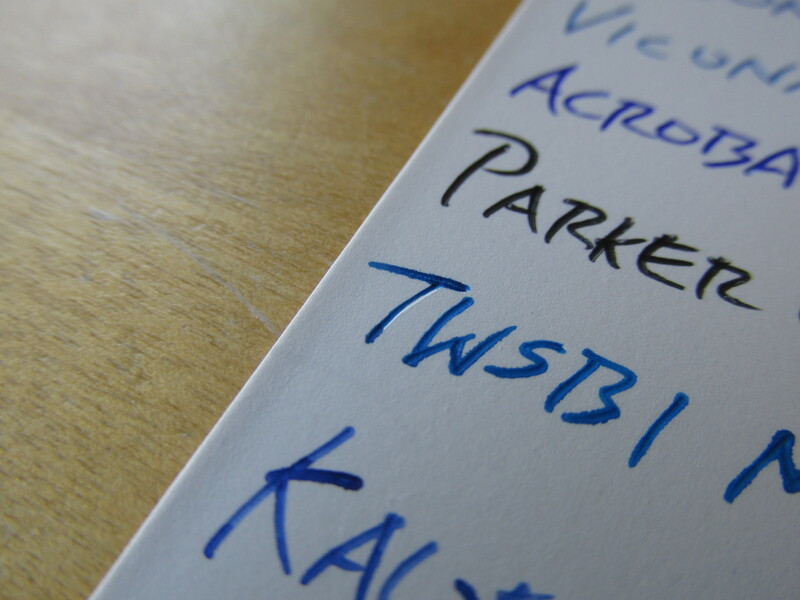 Hybrid inks tend to provide a more solid line than traditional ballpoint ink while still providing the versatility of working on most any paper like a ballpoint. So, the ink is a welcomed addition to the pen wackos toolbox but, given that the Energel does everything hybrid ink can do only more so (darker line, more colors, etc. ), what’s the point of hybrid ink? The answer lies in the more subtle line that hybrid inks lay down compared to full gel treatment. 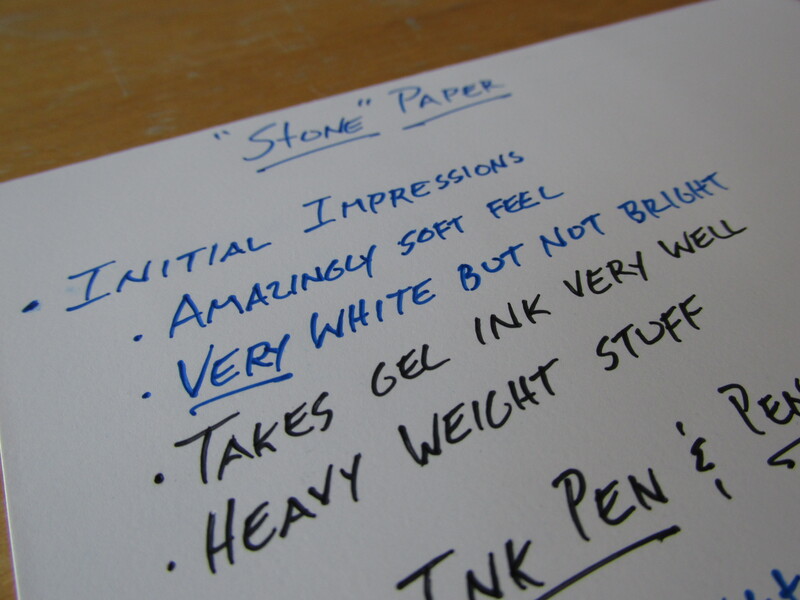 If you’re worried about ghosting on the back of thinner/cheaper paper or if you just don’t want your writing to stick out too much from the surrounding text, then a hybrid ink can be the perfect option. So let’s do some Energel and Vicuna comparisons. First, let’s take a closer look at the lines these pens lays down. Pen #1 is the Energel 0.7 mm. Pen #2 is the Energel 0.5 mm. Pen #3 is the Vicuna 0.7 mm. Pen #4 is the Vicuna 0.5 mm. As expected, the 0.7 Energel is the thickest and darkest and the 0.5 Vicuna is the thinnest and lightest. Let’s combine thickness with darkness and call the combination intensity. If we set the Energel 0.7 intensity to 10, I would judge the relative intensities as followed: Energel 0.7 = 10; Energel 0.5 = 7; Vicuna 0.7 = 6; Vicuna 0.5 = 4. 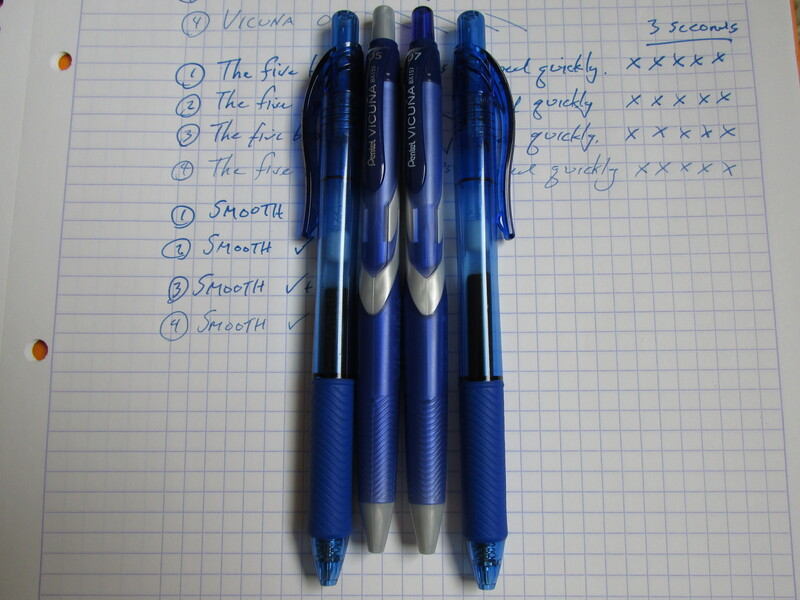 With respect to drying times, all four pens did very well. 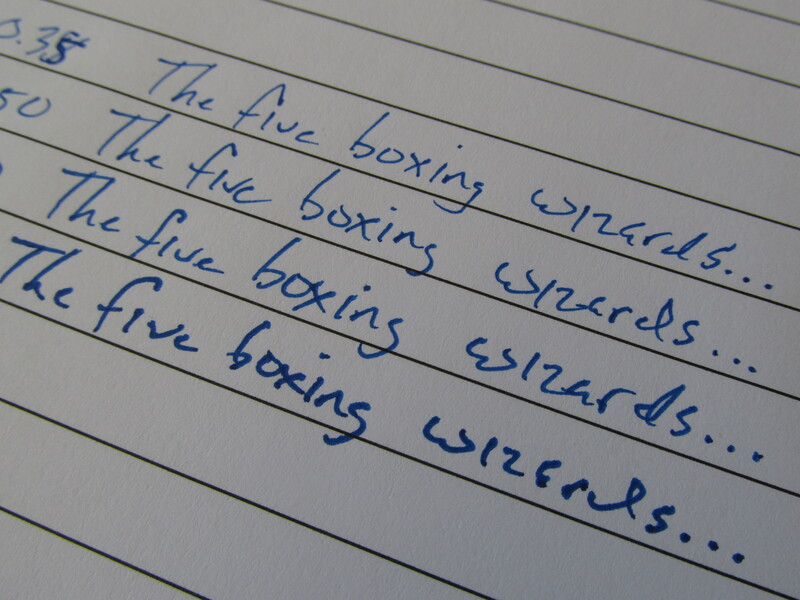 I wrote five Xs on Rhodia paper and waited three seconds before rubbing my finger across the ink. 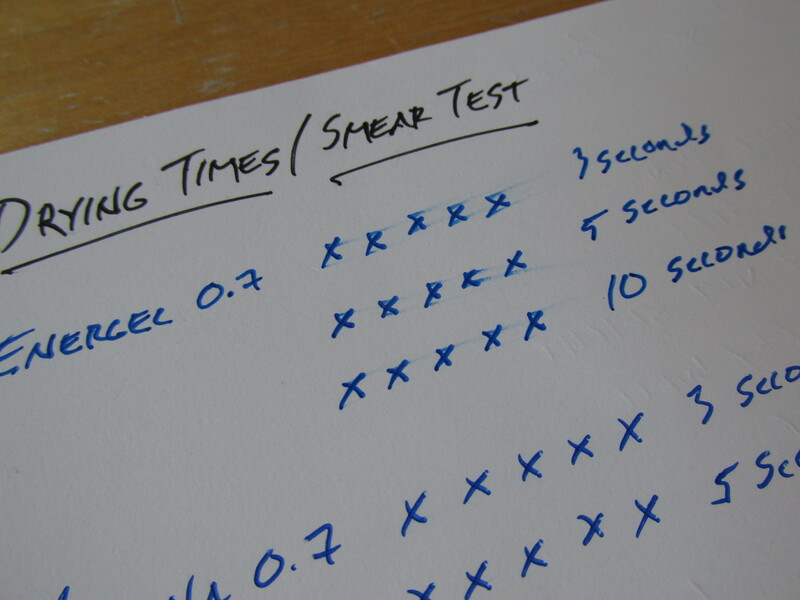 Both Energel point sizes showed the smallest (I mean the smallest) trace of smearing. Honestly, a three count on Rhodia is a very high standard for dry time so I would say all four pens/point sizes perform very well on dry times. As for smoothness of writing feel, I’d order the pens as followed from most to least smooth: Vicuna 0.7 > Energel 0.7 > Energel 0.5 = Vicuna 0.5. Again, this was done with Rhodia paper which has, deservedly so, a smooth reputation so the differences were noticeable but not dramatic. I also tested the relative smoothness on yellow legal pad and the ordering was the same but the differences were a bit more noticeable. 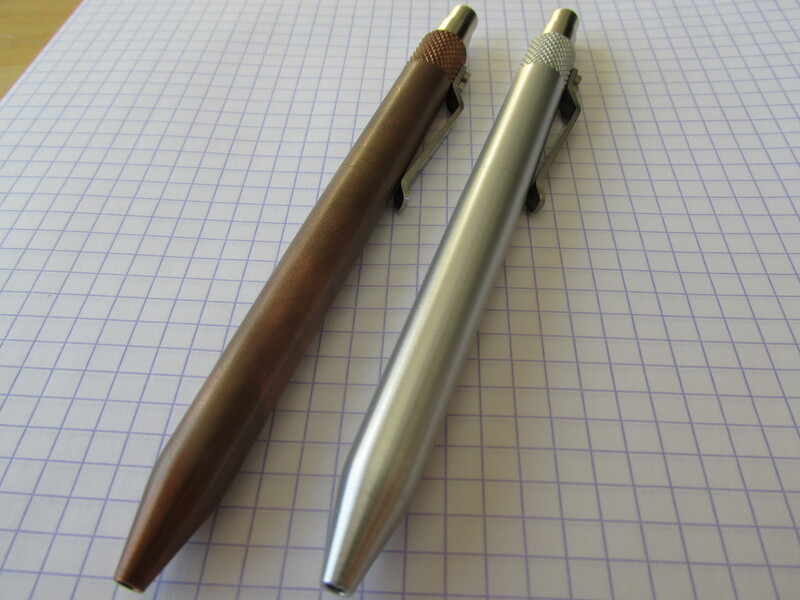 The Vicuna 0.5 dug into the toothier legal pad in a rather noticeable way but the Energel 0.7 and Vicuna 0.7 still offered a fairly smooth ride. One last comparative point to make before concluding. If you look closely at the writing sample above, you can see that the Energel 0.5 leaves tiny hot spots of ink at the top and/or bottom of many pen strokes. It’s not a deal breaker at all, but this is where A/B testing comes in handy. The less smooth ride combined with the slight inconsistency of line width of the Energel 0.5 compared to the other options makes me think that I don’t need to settle for the adequate writing experience of this option. So, if I were conducting a fantasy pen draft (Oh my gosh! How completely nerdy yet cool would that fantasy league be?) what would be my draft order? In the first round I’m picking…the Energel 0.7. 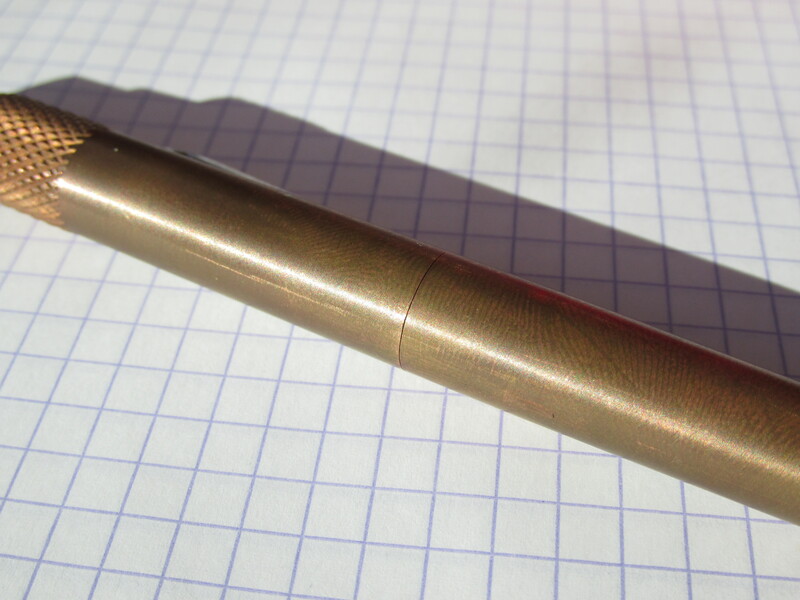 In the second round I’m taking the plucky little pen from Japan…the Vicuna 0.7. In the third round, I might look into trading down for more picks and more value, but if I end up using my pick I would take the Vicuna 0.5 followed by the Energel 0.5 in the last round. On smooth paper, the Vicuna 0.5 gives a tighter line and brings an option that I don’t really get from the Energel 0.5 so I value the Vicuna 0.5 a bit more than the Energel 0.5. 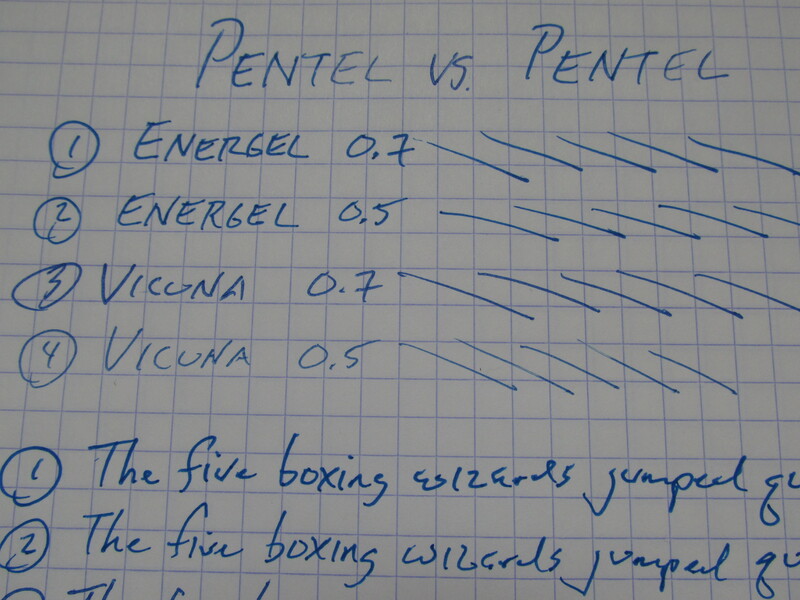 There you have it – Pentel versus Pentel versus gel versus hybrid versus 0.7 versus 0.5. But I am left with one question. Pentel, why won’t you release the Vicuna in the US? 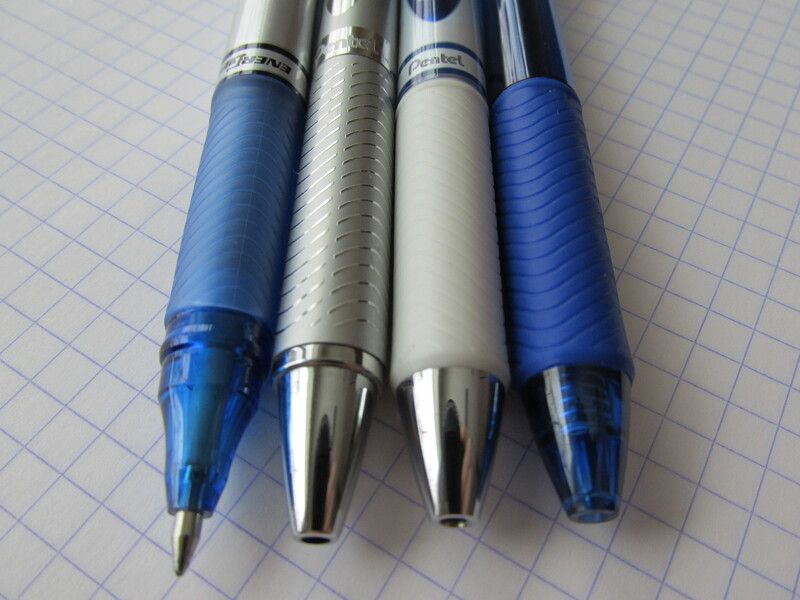 I’m perfectly fine giving JetPens my business, but why not make it more widely available? Welcome to the first multiple pen review done here at That One Pen. 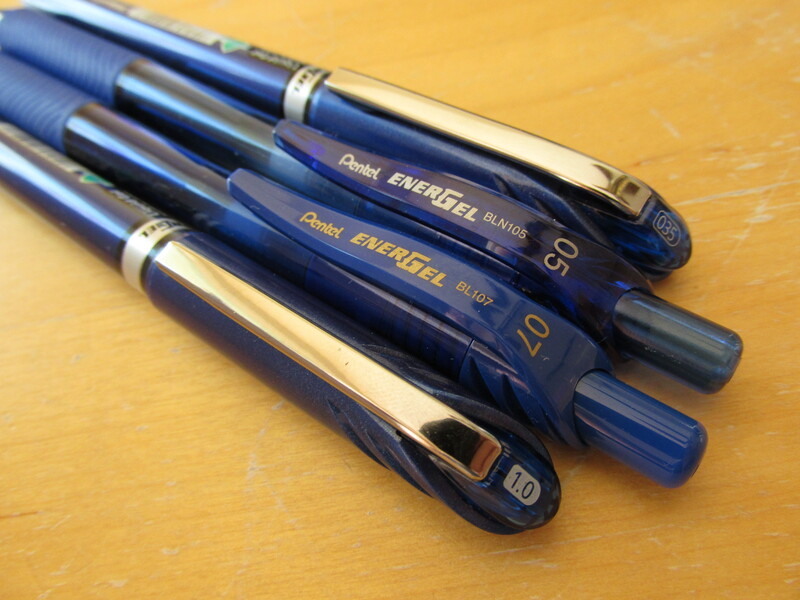 We’ll be focusing on the various forms of the widely available Pentel Energel pens. 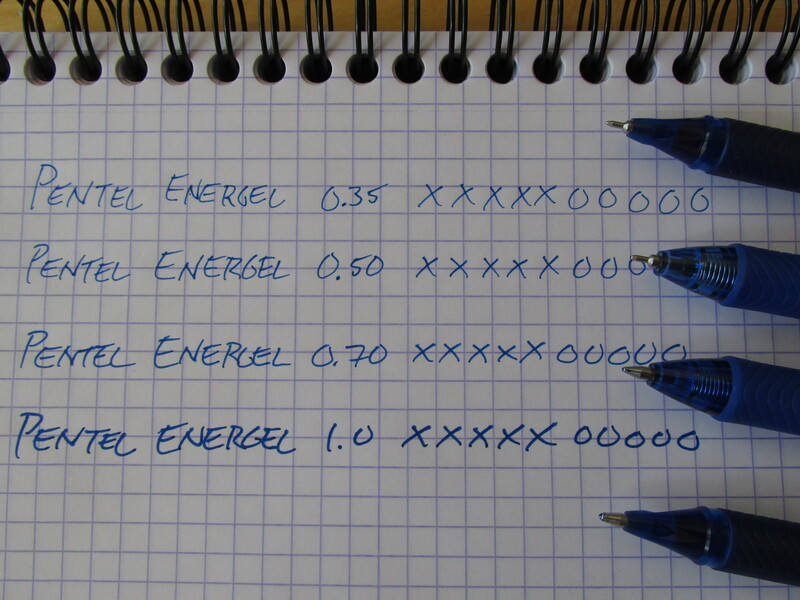 Energels most commonly come in two point sizes: 0.7 mm (M) and 0.5 mm (F). You can buy 1.0 mm (B) and 0.35 mm Euro needle-points online, but I generally only find the (M) and (F) pens in my local office supply stores. 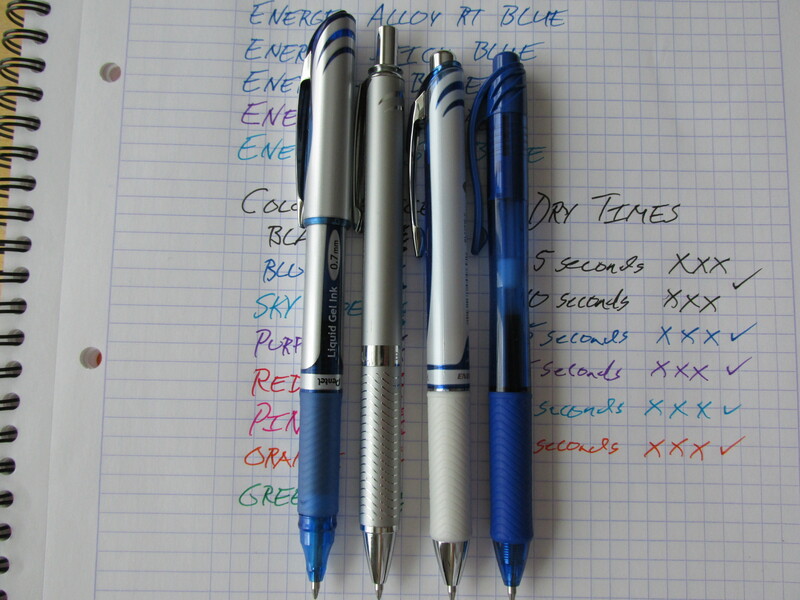 All the pens shown in this review are 0.7 mm (M) points. Going left to right in the picture above we have: Energel Deluxe RT blue, Energel Deluxe RT purple, Energel Deluxe RT pink, Energel Alloy RT, Energel Stick blue, Energel-X RT blue, Energel-X RT purple and Energel-X RT sky blue. You’ll see samples of other colors later; I just want to show the array of options available in the Energel line right now. The Deluxe RT version (3 on the left) also come with grips colored the same as the ink and not just the white grips as shown. If you imagine the colored grips of the Energel-X’s (3 on the right) on the Deluxe versions, you pretty much have it. The Energel Alloy RT also come in different colors. What’s nice is that the Deluxe RT, Alloy, Stick and Energel-X all take the same Energel Liquid Gel refill (LR 10, LR 7 or LR 5 depending on point size). 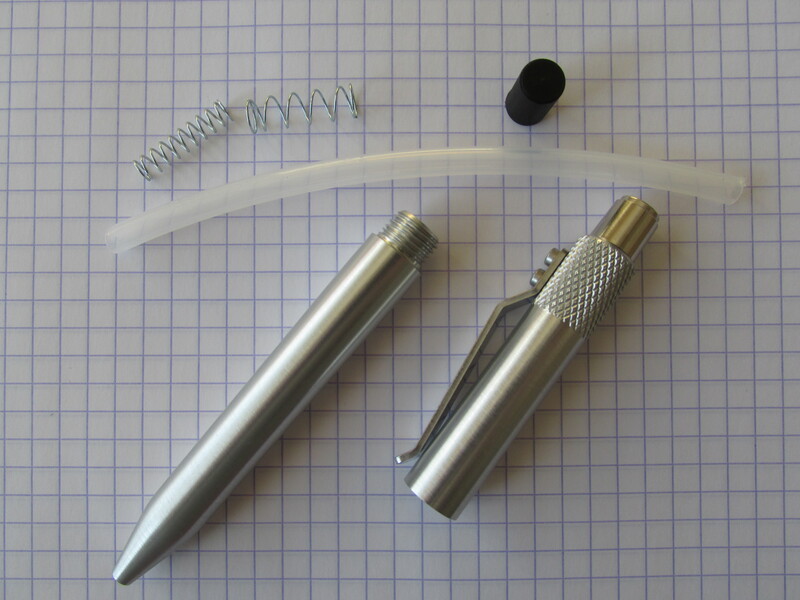 If you’re into the whole hack thing, the LR refills are plastic tubes that can be easily cut to fit other pen bodies. The particular shape of the refill tip limits the pen bodies you can get the LR refills to work with so we’ll leave it to the reader to experiment. 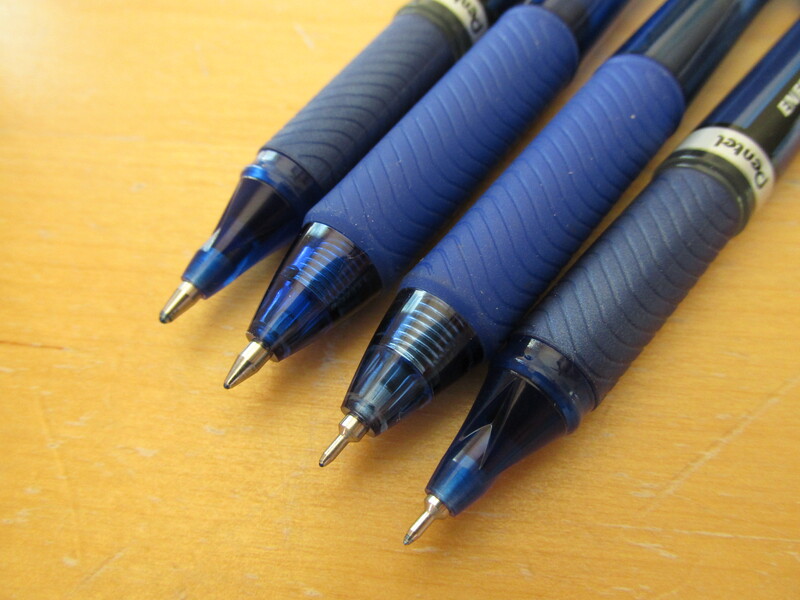 In the US, you can find the blue and black refills at Staples and other major office supply stores if you want to experiment with the refills without getting the actual pen. Given that all versions use the same refill, there are obviously a lot of similarities to the writing experience. The Energel refill is smooth and, most important to us lefties, very, very fast drying. 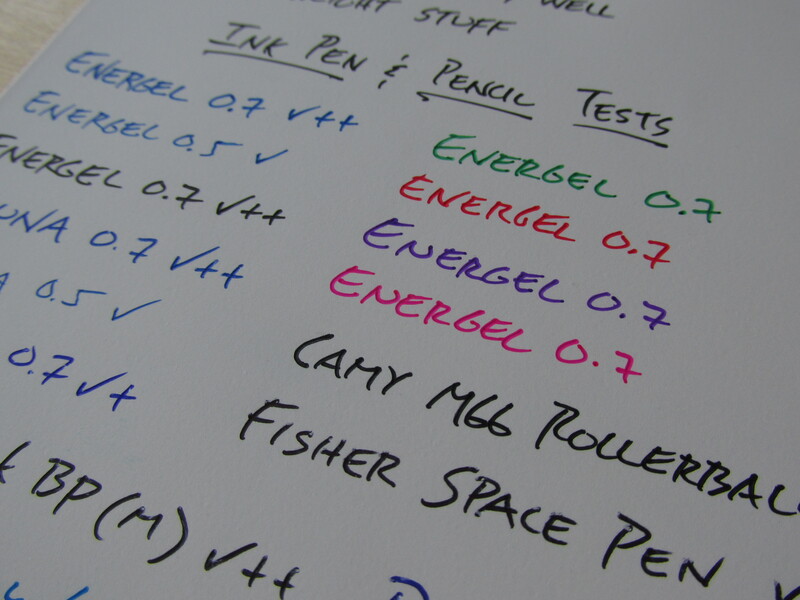 To me, the writing experience of the Energel is a touch smoother than that offered by the widely available Pilot G2 pens but there’s no doubt (none – I’ve checked several times) that the Energel dries faster than the G2. I won’t dismiss the G2 at all. 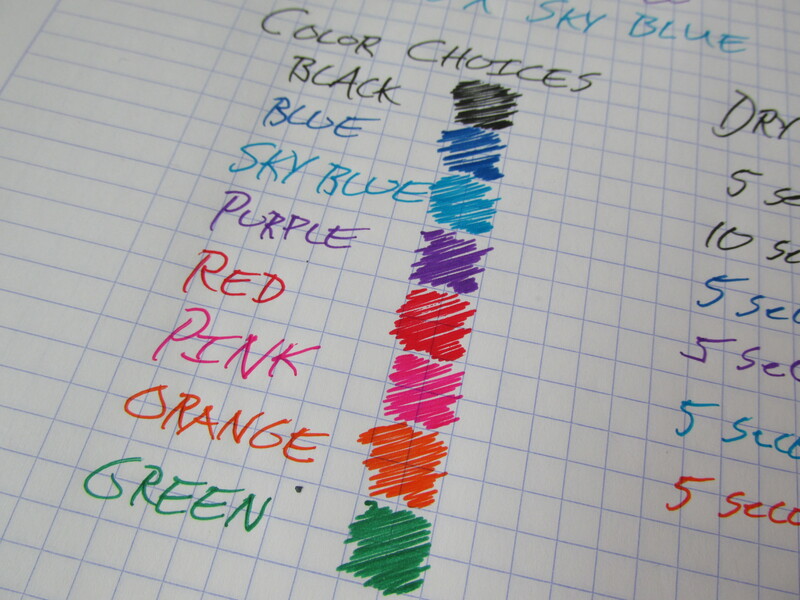 It’s a fine pen with a great range of colors and might even be a bit easier to find than Energel. I find that the 0.7 mm tip of the G2 leaves a thinner line than the 0.7 mm tip of the Energel but again, the G2 is just a touch rougher of a ride. Let’s get to some of the differences, starting with the grips. Below is a close up of the grips for the Stick, Alloy, Deluxe RT and Energel-X RT (L to R). Not surprisingly, the Alloy has the hardest feel followed by the Stick then the Energel-X then the Deluxe RT. I did not measure the grip widths with a caliper, but to my fingers the Deluxe RT feels the widest, the Stick and Alloy follow and are very similar and the Energel-X feels a touch thinner still. Don’t get me wrong – the widths of all the grips are very close. Still, I do feel a difference – certainly between the wider Deluxe RT and the thinner Energel-X. Let’s talk clips. With the exception of the Energel-X and its all plastic build, the pens have metal clips with some plastic tabs near the top. Including the Energel-X, all the clips feel strong and well made. The edges of the clips on the Stick and the Deluxe are a bit sharp and could possibly scratch/dig into the lip of pocket material if you’re not careful. The other noticeable difference is that the Energel-X clip has some printing on it and, unlike the other three pens, the bottom of the Energel-X clip curves away from the pen barrel a bit. When deployed (and capped in the case of the Stick), there are some clear differences in length as you can see below. The Stick is the longest followed by the Alloy. The Deluxe RT and Energel-X are similar with the X possibly being shorter by a hair. When posted, the Stick also feels noticeably wider than any of the other pens. Also when deployed, the Deluxe RT and Energel-X can rattle just a bit because the button does not stay in the pushed-in position. As you can see in the picture above, both buttons are depressed for the Deluxe RT and Energel-X, but they easily slide out to create the rattle noise. The noise is not terribly loud or distracting, but it’s definitely there. The Stick, as you might expect, is perfectly quiet and the button of the Alloy has some added spring tension that keeps it stuck out whether the refill is deployed or not so it’s nearly 100% silent as well. Interestingly and/or unfortunately, you cannot swap parts of one pen with parts of another. 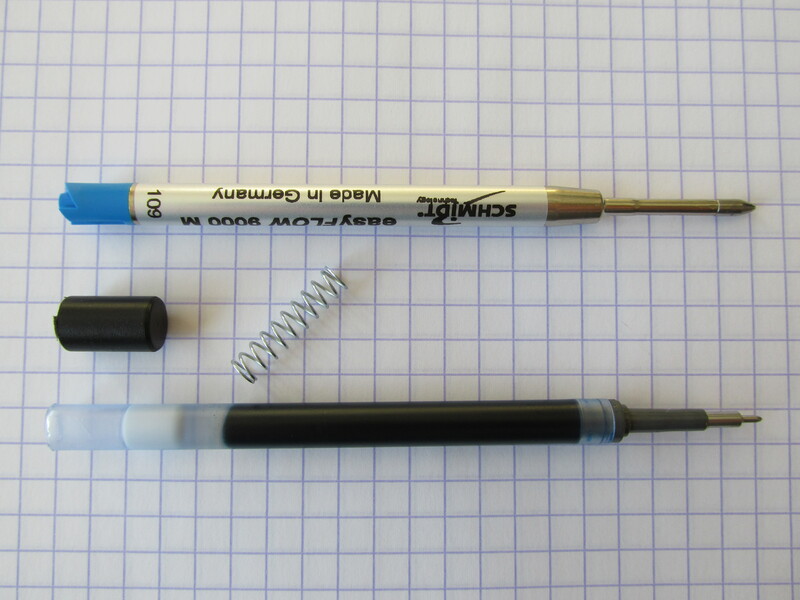 The picture below shows all the pens disassembled. The Deluxe, Alloy and Stick separate at the body/grip divide while the Energel-X opens at the button/body divide. The thread sizes and female/male sections are all different from pen to pen so you won’t be using the grip section of the Deluxe on the Energel-X or, most disappointingly, you won’t be attaching the Energel-X grip to the Alloy body. 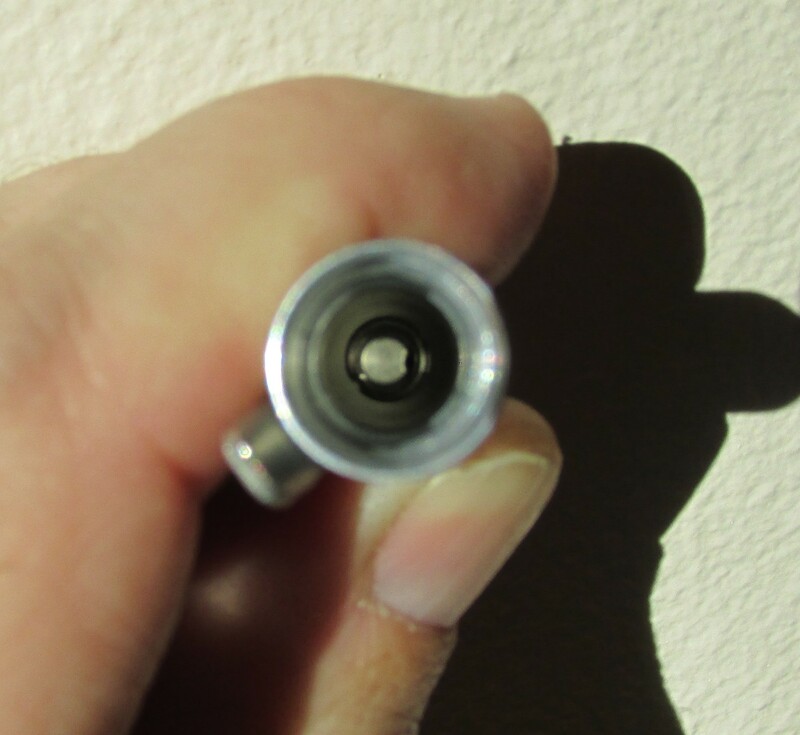 In fact, the Energel-X grip section appears not to unscrew from the body at all. It does look like the grip sections of the Stick (far back in picture) and Deluxe (front in picture) should be interchangeable but it’s definitely a no go. Getting back to the writing experience. Bottom line, I really like the way these pens write. I rarely use an Energel for extended writing sessions, limiting most of my time to writing short notes or, more commonly, to grading tests and quizzes. The writing action is smooth and consistent. I have yet to find a paper surface that causes an Energel to skip. 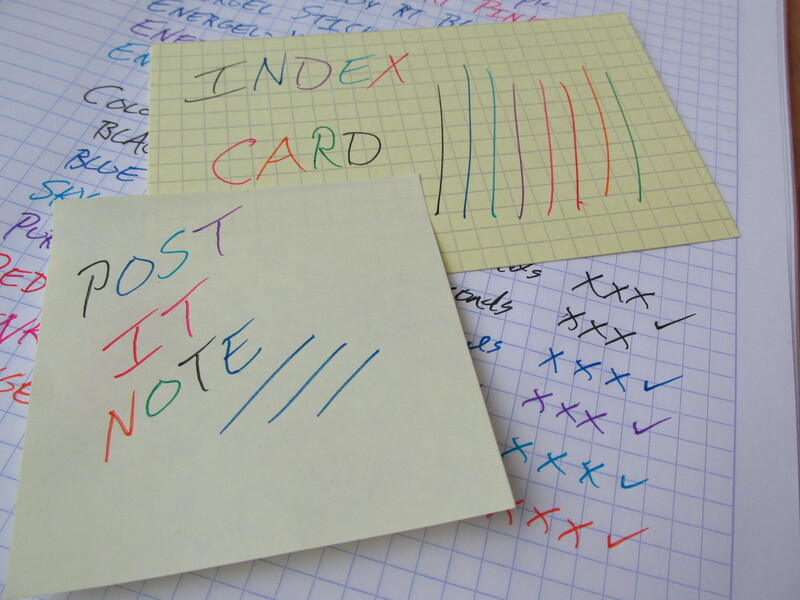 Even Post-It Notes, which can be notoriously difficult for various pen types, are no problem for the Energels. 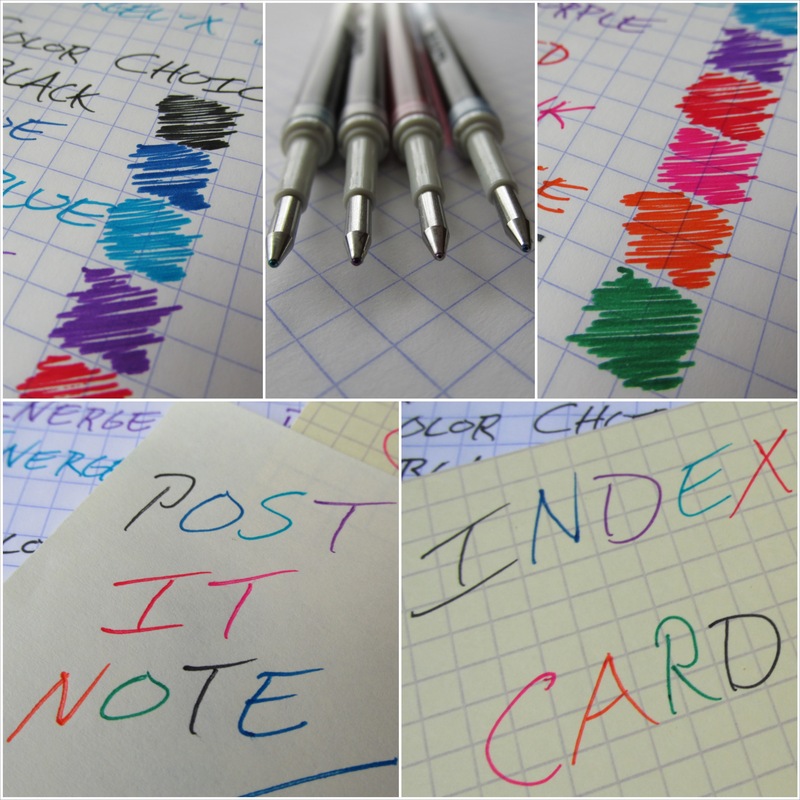 (Aside – I like Parker gel refills but Post-It Notes or slightly glossy paper wreak havoc on them so they’re out). Have I mentioned yet that they dry faster than any pen I’ve found to date. Is the ink waterproof? Honestly, I don’t know and it’s not a test I really care about. Being gel pens there are, of course, several color options available. 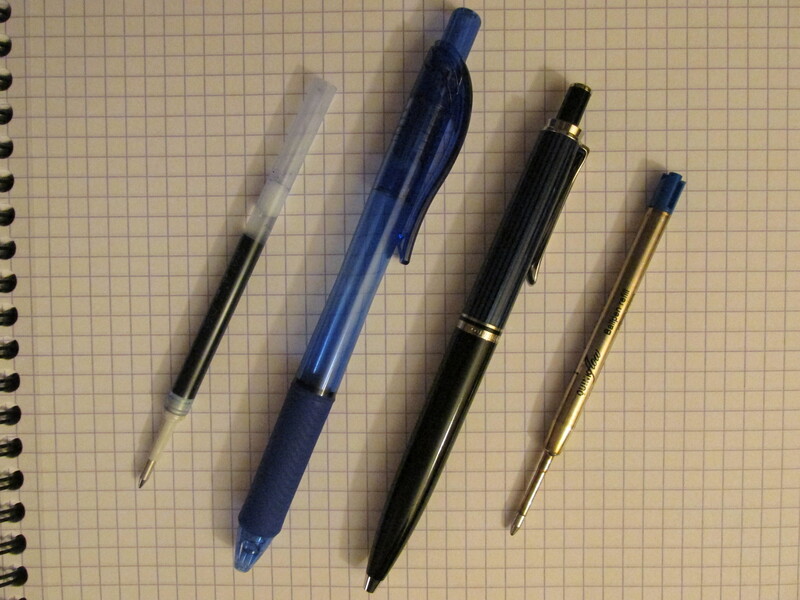 Having used these pens in all their colors for several years, I’ve noticed that the regular blue and black flow more readily than the other colors. For me, the blue and black are almost too slippery on something like Rhodia but work fantastic on “toothier” copy or Field Notes paper. Because they can be purchased readily on their own in the Deluxe version, I’ve used purple and green more than any other color besides blue. But, having recently grabbed a multicolored pack of Energel-X, I see the sky blue and orange getting quite a workout soon. So, do I have a preference between the Deluxe RT, Energel-X, Alloy and Stick? Well, the Stick is definitely in last place for me. In my work flow, gel pens are meant to add a bit of color to lecture notes, write a quick list or grade so I prefer the efficient retractable versions. The Stick is well built and the cap attaches with a satisfying “click” when capping or posting so there’s nothing wrong with it; I just prefer the convenience of the retractable pens. I want to like the Alloy more than I do. The body colors options are cool (especially the black) and they feel built to last. But, the balance is off for me as I wish it was weighted more towards the grip section. For the longest time, I used the Deluxe RT much more than any of the other models. That said, I’ve spent time with the Energel-X recently and I’m changing my allegiance. The ever so slightly thinner feel of the Energel-X, its comfortable but not too soft grip along with its less sharp clip compared to the Deluxe RT work better for me. Importantly, these great refills come in a variety of colors and body styles that most folks should be able to find something that works. 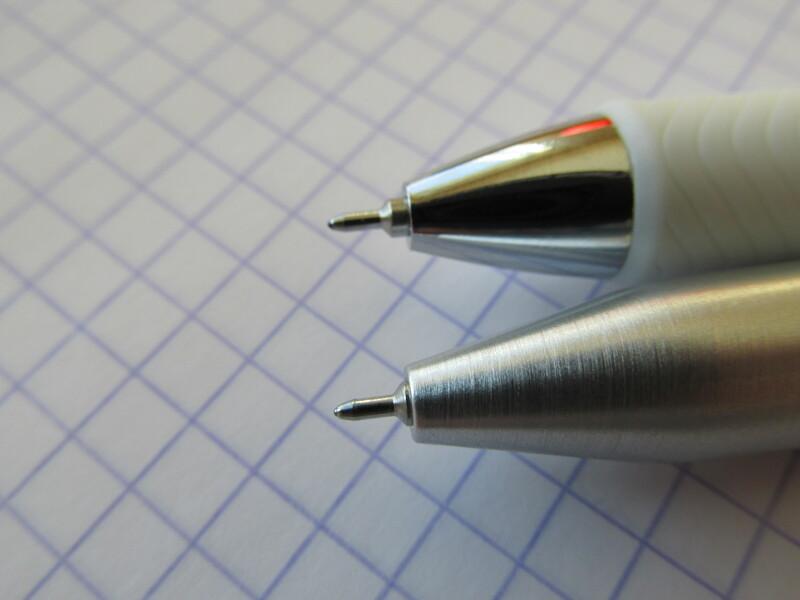 Do you prefer a longer, wider pen? Go with the Stick. Do you want something sharper looker for the office or to give as a gift? Go with the Alloy. Do you like clean lines and Apple-inspired white style? Go with the Deluxe RT. Do you like a slightly thinner grip and/or prefer that the color you’re grabbing to be blatantly obvious? Go with the colorful Energel-X style. The Energel is a “Carry It”, “Desk It” and “Give It” pen for me. I carry them everywhere. There are probably 2, 3 or more on my home and office desks right now and I’ve given them as Secret Santa gifts to make a few converts. The Energel is like my collection of Peter Gabriel albums. I may have too many pens and too many albums to name (and goodness knows I do on both counts). Still, no matter how many pens or albums I get I always come back to my Energel pens and Gabriel albums. The Energel just works for me each and every time just like Peter Gabriel’s albums work for me at any time, while in any mood and for any occasion. Do yourself a favor. Check out the Energel in the style that would work best for you. Here are some other reviews of Energels, including a couple for the Tradio. The Tradio is more refined-looking version of the Stick that takes the same refill and comes in a variety of colors. Energel Pen Giveaway!!! I will be giving away 1 Energel Deluxe RT blue, 1 Energel Stick blue, 1 Energel-X blue plus two(2) other Energel related surprises. 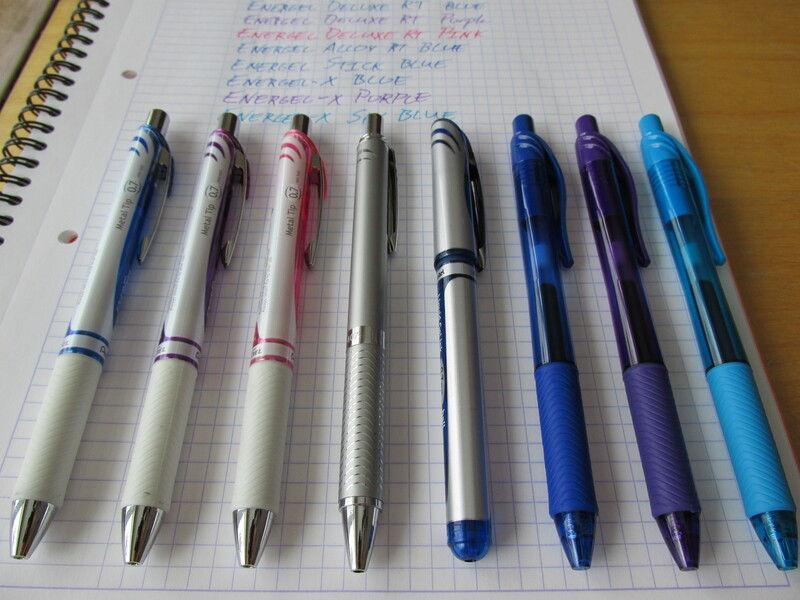 The pens I’m giving away will be new or very, very close to new. To enter, simply leave a comment to this post. The giveaway will close Sunday, February 23 at 5:00 pm Eastern time US. I’ll ship the pens to any US address. The posts will be numbered in the order they are received and a random number generator will select the winner. Feel free to leave up to 3 comments if you’d like to enter multiple times. I may respond to your comments, but obviously my comments are not counted or numbered as entries.